Friday Night Lights continues in 2019! Just $15 on Friday nights. Back by popular demand, enjoy Beech Bend Park in the dark. You’ll be amazed by the dazzling lights that create a whole new park experience. Conquer the unexpected twists and turns of the pitch black Kentucky Rumbler or be amazed at the spectacular light displays of Air Race or Vortex. “We have been purchasing rides with beautiful, LED light packages for the past few years, and we are excited to show them off from Memorial Day weekend through the first week in August. 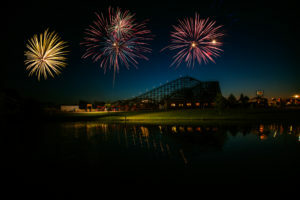 This year our guests will get to enjoy Friday nights beginning with the Friday of Memorial Day weekend as we celebrate “Friday Night Lights”, commented Park President, Dallas Jones. Enjoy all the rides in Beech Bend Park for the family-friendly price of just $15 from 5:00 to 9:30 pm Friday nights beginning May 24. Your special Friday night ticket also includes Splash Lagoon Water Park from 5:00 until 7:30 pm!